We were partners in World Lit II Class. We were active members and leaders at the campus’ Association of Baptist Students. We spent a lot of time eating out, hanging out in my dorm room (Bussey Hall), and watching movies together. Married 4 years this July, together 6 years this October. We got engaged in the parking lot of the Association of Baptist Students, where we first started dating. We later came back and took some of our engagement pictures at SAU. 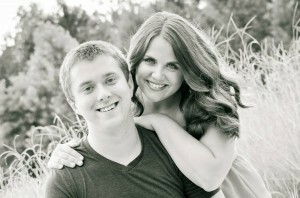 We dated for a year before we were engaged, and so many of our dating memories were at SAU. Wilson Hall where we had class together and met, Bussey Hall where we worked together on our class project and later hung out, the Business building where I (Hannah) would wait for him to get out of class- to name a few. I (Hannah) came to Magnolia 7 years ago to get my degree, and ended up staying here because I found love. We now work here and call Magnolia home. For that, I will always be grateful. A piece of my heart will always be at SAU!